Theatres are often the most unique and glamorous structures in a downtown district, the marquee itself might be the most recognizable downtown symbol in any town. 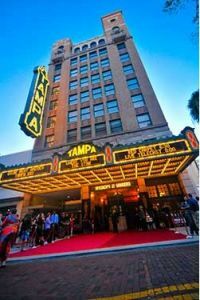 Beautifully restored historic movie and performing arts theatres add tremendous appeal to historic Main Streets and downtowns throughout America. They bring art, culture, and entertainment to many, add vibrancy to their communities, and are triumphant showcases of preservation and revitalization at work. Historic theatre buildings are often unique, and this should be reflected in the insurance products that protect them. The architectural design, interior decor, and other historic elements need to be covered with valuation that will pay to restore the building after a loss in order to preserve the historic significance and splendor of the theatre for future generations. In addition, the liability exposures for large public gatherings, children’s programs, in-house and traveling productions, special events and workshops need to be considered and properly covered to protect the foundations and organizations that govern the theatre.